Finland’s independent liberal newspaper, Helsingin Sanomat, welcomed the two presidents as one with a series of billboards on their route between airport and summit location. “Mr. President, Welcome to the land of free press”, read one particularly direct billboard. 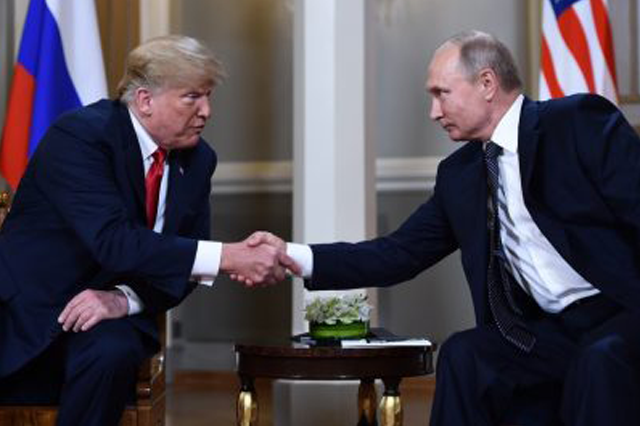 A telling entry of a summit that showed both the commonalities and the differences between US President Donald Trump and Russian President Vladimir Putin. The first comments together with the pictures of their meeting in the residence of the Finnish President made them even more visible. Both effectively presented their respective version of strong man poses to the public. Both knew already how to sell the summit as their respective success, without having solved any fundamental conflicts. Despite domestic pressure on Trump regarding Russia, and despite the many years of mobilization against the American foreign enemy in Russia, the two presidents could not fully hide their sympathy towards each other behind their poker faces. They were able to do this because their critics at home and abroad are practically the same. Both are well accustomed to being called “bogeyman” by the defenders of international law, press freedom, human rights, liberal democracy, decency and truth. However, one this is for certain – they do not like to appear weak. Yet what has become public of the talks also highlights the distinct differences between the two strong-men. While Putin has almost carte blanche to enforce the results of his negotiations internally, Trump has to deal with functioning democratic institutions and the American system of checks and balances. The thorough preparation of cold calculating Putin seems to have paid off against Trump’s intuitive chaffer. Putin got away once more with lip-service of having “no interest” in meddling in the US presidential election of 2016, the same as without having to make concessions towards his allies in the Syrian civil war – Assad and Iran. Additionally, the named topics of discussion included trade, security cooperation and nuclear disarmament – a walk in the park for President Putin, who avoided have to talk directly about accusations election meddling. Bilateral discussions on these and other topics of geopolitics is to the taste of two presidents, who both think little of multilateral talks with smaller, less influential countries at the table. They might be able to solve some problems, but to the EU and other neighbours this looks like Great Power politics. Moreover, the structural conflict remains unsolved between two heads of state, that see themselves as fighters of national interest in a geopolitical zero-sum game between states. To them, every concession remains a bilateral object of negotiation with concrete costs or is seen as a sign of weakness. Due to their regular aggressive messaging, both of their core supporters expect not only diplomatic skill but more so steeliness in their interaction with the other. In that lurks another danger for the development of their talks. Cooperation in Syria would demand giving up spheres of influence and options to interfere. Thus, successful cooperation fighting terror requires giving up sensitive information, enforcing disarmament in the logic of the mentioned INF treaties of 1987, and transparent access for all controllers. Real détente can only derive from long term trust-building and the strengthening of institutions against national sovereignty. The final act of the Conference on Security and Co-operation in Europe (CSCE) as an important milestone of the détente politics between the states of NATO and the Warsaw Pact was also negotiated and signed in Helsinki, 43 years ago. It was signed by 35 States from the West and East, a product of a long process of institutionalized cooperation and trust-building for many years. We can only hope that there is political will to solve problems in the same logic today. Without the participation of the EU, this could otherwise lead to new conflicts and a further transatlantic estrangement. If all of this was only for the public show for the media for interior reasons, then they will be only united in the war against their critics home and abroad, who they scare with unilateralism and gestures of fraternization. This would leave no room for real détente, because that would require institutions and trust between partners rather than unilateralism and short term demonstrations of friendship between two men.